From lush English-style gardens to desert lands, Victorian farmsteads to stone corbelled houses, the variety on offer at farmstays in the Karoo is astounding. Here are a dozen top spots to hang your hat in the Heartland. The youngest Brown living on the heritage farm of Glen Avon is the 9th generation of this family to have stayed here. As you walk around this farmstead and its outbuildings, you are seeing centuries of history: an old mill, a shearing shed that once served as an officers’ mess in the Anglo-Boer War, massive oaks with ancient markings and the impressive Boschberg mountain range looming overhead. Cavers is all about the most stunning garden, one of the firm favourites of Bedford’s annual Garden Festival. There’s an elegant manor house for guests and dinners range from farm lamb to venison, with farm-fresh milk, yoghurt and cheese on offer. The Bedford area is 1820 Settler country and Cavers is one of its top historical assets. Set in the neighbourhood of impressive Cape Fold mountains, Noorspoort is owned by the Craven family and has long been a venue of choice for wedding planners, photographic instructors, school outings and those on romantic escapes. Expect to snuggle into goose down duvets when you sleep in the old main homestead. In fact, they even offer a course on goose farming if that catches your fancy. 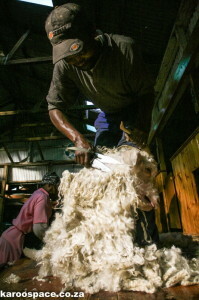 Now you’re on a sheep, pecan and cattle farm in the middle of the traditional Fish River community. Old families live around here, and they still play tennis most weekends at the local club and pray together on Sundays at a venerable little church nearby. 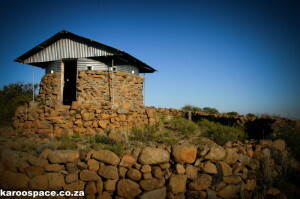 Right next to your little stone cottage is an Anglo-Boer War blockhouse riddled with bullet holes. You don’t really sleep closer to history than this. One of the delights of Hillston is to be able to walk over the veld to one of the nearby ridges and gather in the awesome views below. They also feed you like royalty and if you like blue cranes, get up early in the morning and watch them take off from a nearby dam. Schanskraal is an upmarket country escape that comes complete with Manor House and Arabian studs. The venue has become internationally famous for staging the South African 160km Endurance Riding Championships in October. 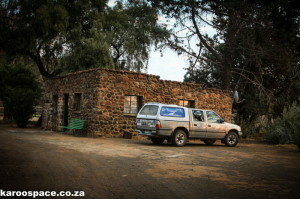 For those who like action holidays, Schanskraal offers superb wing shooting, horseback riding and rock art outings. 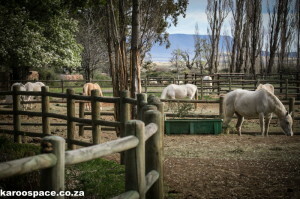 Ganora is one of the model guest farms in the Karoo. The owners, JP and Hester Steynberg, are interesting and committed hosts. And the farm, tucked away in mountain folds near the legendary village of Nieu-Bethesda, is idyllic. JP has a keen eye for fossils and takes you on very interesting ‘stone bone’ outings, while Hester runs a meerkat rehabilitation centre which children find fascinating. The farm has a superb fossil museum, the food on offer is top-class and the lodgings are most comfortable. Here it’s all about stoep-sitting, drinking in the peace and going for long contemplative walks in the veld. 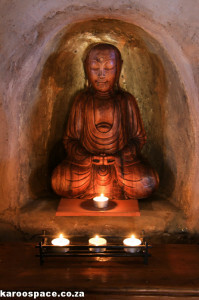 Or you can attend periodic Zen Buddhism retreats.. The farm belongs to Margie and Antony Osler. Antony, a spiritual teacher and writer, is the author of Stoep Zen and Zen Dust. There are several places to stay on the farm, including a lovely self-cater cottage. It has no electricity, no television, no cell phone signal and no wi-fi. But it does have good books, candles, hot water from a donkey boiler, a fire place, a profoundly comfortable bed and stoep that will help restore your sanity. 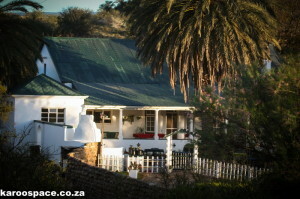 Another great farmstay with many offerings, Prior Grange lies on the N1 highway and is an ideal country stop-over for families. You’ll definitely want to stay more than one day. Blackie de Swardt is a farmer with a particular interest in the Anglo-Boer War. 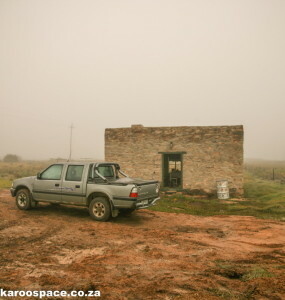 There’s an old blockhouse on a hill at Prior Grange overlooking the N1 – and he can take you up there and tell you stories you’ll never forget. Prior Grange also has a special Farm Trail around the homestead which is very interesting and, if you’re lucky, there’ll be a weekend cricket game going on at The Oval, the nearby farm pitch. Sheryl de Swardt runs five guest cottages and ensures the meals are of excellent quality. Kay Fourie and her husband Andries live on a seventh generation farm called Rooipoort, only 15 minutes out of Philipstown. Here, she offers guest accommodation in and around their splendid old house with its thick walls and high ceilings. There are black eagles and blue cranes to see, and lovely walks in the Karoo veld and koppies. Another of the attractions is Kay’s intriguing art. She has recently produced a beautiful series of lithographs of local people. Tel: +27 (0) 83 277 414211. Early in the 20th century, a bywoner (subsistence tenant) called Fanie Bergh and his family came to live in a magical place called Stuurmansfontein, tucked in a fold of rolling hills of the Northern Cape. The Berghs lived in an exquisite corbelled house, a beehive-shaped home of rocks that held the heat of the sun in winter, with thick walls to keep them cool in summer. And this is where you’ll be staying. It’s comfortably kitted out, and when you read the guest book you’ll see Stuurmansfontein is well-beloved around the world. After supper on a clear night, just step outside and take a seat. You’re suddenly in a world of bright stars and utter peacefulness. 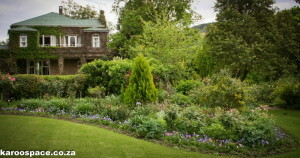 You can stay in a fully-furnished cottage or, like we did, opt for a rustic little dwelling ‘out in the flowers’. And, when the spring flowers are in bloom in this part of the world, this is precisely where you want to find yourself. The stone house is charming and very cosy inside. You cook on a gas stove and play gin rummy by candle light. And when you wake up in the morning and look outside your window, you find yourself in a dazzling world of colour. Good morning, Namaqualand! Not sure why Melton Wold was not included in this line up of farm stays? 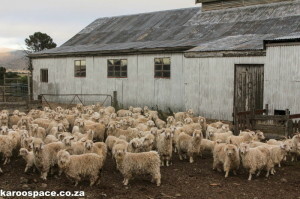 – best Karoo farm stay ever! Perhaps because it qualifies as a hotel and guest house rather than a self-catering farm stay. 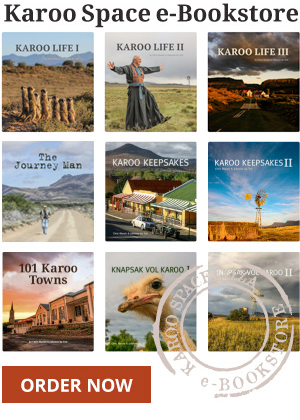 We are planning a trip to the Karoo next year, I’d really appreciate some help in planning an itinerary . 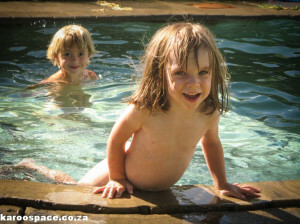 It will be either the end of January or the middle of February, I know it will be very hot! We are not looking for an organized tour, we want to drive and stay at farms or hotels, is a resource I can use to get the cost of these accommodations? Any suggestions would be greatly appreciated. Hi Denise – Whew! I think a first long trip through the Karoo should be through the Eastern Cape part of it: the Karoo Heartland. 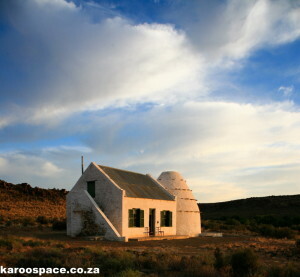 In the light of that, I suggest you type in ‘Karoo Heartland’ in the search box on the Karoo Space Home Page. There you will find all manner of stories and links about the area, which takes in a dozen towns, many good hostelries and some great farm stays. Take your time reading as much about it on our site and then contact Alan Hobson (Angler & Antelope Guest House) in Somerset East. 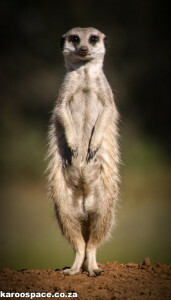 He’s the head of Karoo Heartland Marketing and will help you. Budget at least a week of your time to see this area. Currently at beautiful Temenos in McGregor lying on my bed reading all your Karoo stuff. Seriously all quite brilliant. Well done you two. Abientot. Rod and Chanel Hossack.